This Post has already been read 1029 times. Microsoft Mobile Devices & Services announced the availability of Lumia 435 Dual SIM and Lumia 532 Dual SIM smartphones, the most affordable Lumia devices to date in Pakistan. Offering the latest Windows Phone 8.1 capabilities at incredible prices, both Lumia 435 Dual SIM and Lumia 532 Dual SIM deliver smartphone experiences that help people do more on the go. With many people looking to upgrade from a feature phone to a smartphone for the first time, Lumia 435 Dual SIM and Lumia 532 Dual SIM provide a balance of features and power, while also bringing Windows Phone 8.1 experiences to new price points. Lumia 435 Dual SIM is the first 400 series Lumia and the most affordable Lumia yet. With core smartphone features, incredible Windows Phone experiences and access to the latest apps, it opens up the Lumia experience to even more people. 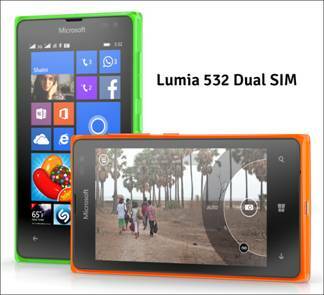 Lumia 532 Dual SIM is a powerful quad-core smartphone that builds on the success of the Lumia 530. With a premium layered design, Glance Screen, front-facing camera and more memory than the Lumia 530, Lumia 532 Dual SIM enables people to achieve their goals with Microsoft experiences. People can switch effortlessly between voice and video calls with built-in Skype integration and a front-facing camera. They can read, review, edit and share on the go with the preinstalled full suite of Microsoft Office on Windows Phone. The 30GB of free* OneDrive cloud storage lets people keep their photos, videos and Office documents safely backed up. Microsoft Outlook enables easy management of work and personal correspondence while Lumia Camera captures photos quickly. The Lumia Selfie App lets people take, edit and share great selfies with the front-facing camera while the latest version of Windows Phone 8.1 with Lumia Denim update is loaded with one-swipe Action Center, Word Flow and Live Folders. 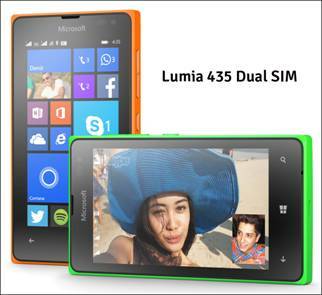 Lumia 435 Dual SIM and Lumia 532 Dual SIM are available in Pakistan for PKR 10,350/- and PKR 12,000/-respectively. They come in bright green, bright orange, white and black colours.